When storms occur, roofs are the main target for hail and wind damage. The effect of hailstone impact on roofing materials has been studied by several different authorities, including the U.S. Department of Commerce. Their findings, published in a paper entitled, “Hail Resistance of Roofing Products,” indicates that damage to shingle roofing should not be defined as cosmetic surface indentations. Only actual fractures in the surface coating or base material should be defined as damage. Superficial scuffing does not interfere with the performance of the roofing product. The Commerce Department’s tests further revealed that fiberglass-asphalt shingles, as opposed to the older organic-mat shingles, have excellent resistance to hailstone impact — at least for hailstone less than or equal to two inches in diameter. The reason is that the fiberglass mat provides greater tensile strength and toughness inside the shingle. 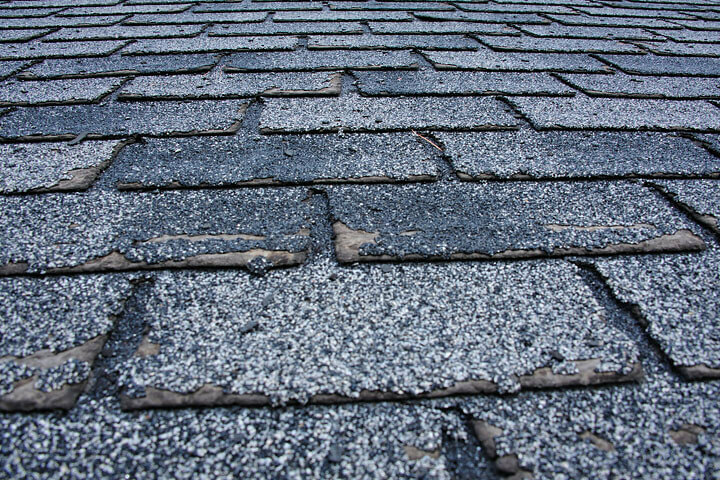 The amount of hail damage suffered by a roof depends on its age and on the type shingle used. The older and weaker organic felt-based shingles are known to undergo rapid natural deterioration from ultraviolet radiation exposure. The deterioration is usually manifested as cupping or curling of the individual shingle and/or extreme loss of granular surface material. When hailstones strike the surfaces of these older, brittle materials, they can actually break through the shingle. This leads to a rapid degeneration and material breakdown, increasing the chance for leakage. Small indentations on shingles, therefore, are not considered damage, if the fiberglass base mat is not fractured. Breaks in the base mat will allow leaks, while surface dents and dings will not affect the shingle’s ability to repel water. Hailstones with diameters of 1-1/2 inch or more are usually required to break shingles or knock holes in them. Accompanying high winds can damage roofs by blowing off deteriorated or loose shingles, and cause other problems as well. A common problem with assessing wind damage is that strong wind is often blamed for damage to a home that existed before the wind, but was never noticed until a storm or the close proximity of a tornado prompted scrutiny. Besides knowing that a direct hit by a tornado will shatter and scatter almost any building, or that direct hits by tornado-launched debris can inflict much damage, most people know little about any other effect a tornado can have. Research conducted by the University of Chicago, The National Weather Service, the Institute of Disaster Research, and others has established common rules about tornadoes and dismissed some of the myths, such as atmospheric over pressure damages to residential buildings, with the book most often cited being, Tornado: An Engineered Oriented Perspective. This book describes tornado damages as always increasing from the “outside in” and the “top down.” Residential buildings invariably suffer much worse exterior damages than interior damages and invariably these damages are also worse on the upper levels. The primary destructive components of a tornado are wind pressure and flying debris. Therefore, a tornado is likely to damage the roofing and exterior siding of a building prior to causing damage to the interior or foundation structure. Hence, unless exterior damages are significant, the likelihood of interior damages are very small. Yet, many people insist that a passing tornado “twisted” their home, or lifted it off the foundation and set it back down, causing damage. This discovered damage is often the result of years of poor maintenance, noticed only after a tornado has passed.